Click the button below to add the Multi line laser Professional series 3 Year warranty to your wish list. A must for Builders, cabinet makers, kitchen installers, television installers, flooring specialists and general tradesmen these digital dot and cross line lasers are simply awesome small, compact and highly accurate these units allow you to project a line a cross hair all with the one small tool. The General XL1 is a self-levelling, red-beam multi‑line laser that is capable of performing a wide range of tasks thanks to its horizontal and vertical lines. 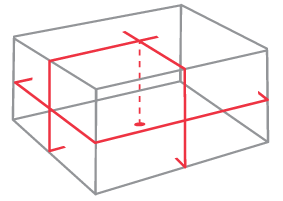 The horizontal line has a fan angle of 120° that can be rotated in any direction around the laser by simply manually turning the laser level. It is equipped with two vertical lines that are spaced 90° apart that can be used tasks such as squaring off. The General XL1 features a tilt alarm to alert the operator if it is outside of its levelling range, as well as a pulse mode function that can be used alongside an optional detector when the laser beam is unable to be seen with the naked eye.